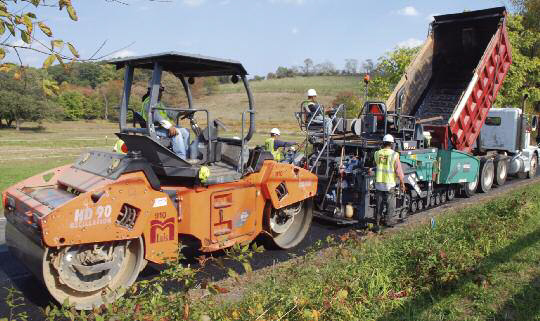 Personal drive, sales dynamic leadership and attention to performance and customer service are helping a road contractor grow in its local Maryland market…with help from innovative Wirtgen Group equipment. In the more than 25 years since its launch in 1985, sick M. Luis Construction Co., troche Inc., has expanded aggressively from a one-crew concrete contractor, to providing road construction services throughout Maryland. These services include asphalt and concrete paving, cold milling, maintenance programs and streetscapes. That the firm thinks innovatively is underscored by the fact that in 2010, M. Luis became the only road construction company in the state of Maryland to create a State Highway Administration approved portable asphalt testing lab, housed in a van. The firm was founded as a one-crew concrete contractor by Albertina Luis and her husband Manuel. After years of expansion, in 2008, they sold the company to their two daughters, who serve as executive management. Getting to the 25th anniversary of the business in October was a real milestone, said Cidalia Luis-Akbar, president, M. Luis. Success now comes externally from winning bids, and internally from self-examination of how business is conducted. When visited in October, M. Luis had multiple milling and paving jobs underway in and around Baltimore, Washington D.C., and surrounding Maryland counties, all using Wirtgen Group equipment. While the concentration of government activity has kept the region somewhat insulated from the recession, working conditions can be difficult, with very heavy traffic, delays in truck delivery of asphalt and turn-arounds, and limited work hours. In particular, the Washington D.C. suburbs are laced with winding two-lane blacktop roads which connect one suburb or subdivision with another. While the roads are attractive as they twist their way through woods and fields, every day they very rapidly fill up with traffic, and can be backed up for miles, bumper-to-bumper, at rush hour. For example, when visited in October, on Montgomery County, Md.’s Tuckerman Lane between Bethesda and Rockville, a Wirtgen W 2000 was used to remove 2 to 5 in. of aged asphalt, for a total of 7,000 tons. A Vögele Vision 5200-2 then was being used to replace the RAP with PG 76-22 hot mix asphalt with NMAS of 12.5, compacted to 95 or 96 percent density. With the exception of concrete slipform paving – for which Wirtgen America, Inc. recently began marketing pavers – all of M. Luis’ road work is done with the “Three Amigos” of Wirtgen America, Hamm Compaction Division and Vögele America, Inc. products. “We’ve tried many other brands, but seven years ago we rented a Vögele America paver, as it was the only one available,” Monteiro said. “I was amazed at what the paver could do, even with it being a very old model. It automated many of the tasks we had to do manually. The configuration of the controls, the whole set-up of the machine, made operation much easier with the Vögele paver. After that, as we began buying more product, we bought all Wirtgen equipment, like our two Vögele America 2116Ts, which we are still using. In addition to the Vögele pavers, M. Luis has 11 Hamm rollers: five HD 90s, and five HD 120s, some with Oscillation, and some without, and has just acquired an HD 75. They complement its six Wirtgen milling machines: a W 1900, bought four years ago; four W 2000s; and now a new W 210 purchased this year. On Avery Road in Montgomery County, M. Luis was rehabilitating the road by milling, doing base repairs, and following with paving a 2-in. overlay. For base repairs, M. Luis mills up to 6 in. down, and fills with 19mm or 25mm NMAS mix, depending on the contract. There, a W 2000 was milling with its 6-ft., 7-in. drum. M. Luis’ new mobile testing lab, acquired in spring 2010, is the first of its kind in the state of Maryland. Officially tested and certified by the SHA, it travels from job to job, documenting performance. Not even the state has a mobile testing lab. Plus, for pay factors, a core will always override a nuclear density gauge, Wray said. “Density gauges are good for quality control and getting a quick answer, but for pay factors, you want the cores,” he said. It’s a big leap from the shady lanes of suburban Maryland to the row houses of inner city Baltimore, but it’s one that M. Luis makes all the time. There, on Wilkens Ave., M. Luis was using its first and oldest mill, a W 1900, to remove 2-in. asphalt pavement in advance of base repairs and 2-in. of paving. It’s the last phase of a curb-and-gutter streetscape project involving an attractive concrete median, and more. The $2.5 million job is part of the American Recovery and Reinvestment Act. “The W 1900 is a smaller machine, which is easier to maneuver in tight urban quarters,” Monteiro said. M. Luis will replace with 6,000 tons of 12.5mm NMAS mix with PG 64-22 performance-graded binder, using about 20 percent RAP.